There can't be many reasons to own two MGB GTs but earlier this year I found one that seemed fairly cast iron. 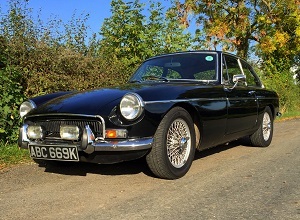 When Great Escape Cars originally bought the 1978 BGT - that you can read about on this blog - it was going to be used for a TV programme, with filming due to start in March 2015. So the car went into our local body shop in autumn 2014, giving six months to complete a fairly simple restoration and respray. With the film dates rapidly approaching it became alarmingly obvious that the car wouldn't be ready. In fact, it hadn't even been started. Cue Plan B: find another, similar MGB GT. 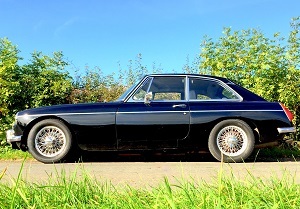 And so it was that I bought this 1971 example in early March 2015. For a B it's a fairly rare example being black and with the short-lived 'Mustang' style recessed front grille that was designed to modernise a distinctly unmodern design. MGB prices fluctuate more regularly than Brazilian exchange rates and I happened to be looking during one of the highs. Locating a good car at a sensible price took some doing but this one turned out to be a winner. I bought it from a dealer - not my preferred route, but needs must - and it was exactly what I wanted: a tidy, solid car but not excessively so. The tough filming schedule through up a few inevitable issues, which our workshop sorted, and by June the car was proving very reliable. But the bodywork was less so. The dealer had done an excellent job of valeting it, disguising the myriad of dings, scratches and blemishes that, close up, detracted from the car's appeal. This car was therefore an obvious candidate for renovation over the winter of 2015/2016. Click on the links below to find out what we've been up to with the B. Or call 01527 893733 to discuss this project or your own. Visit www.greatescapecars.co.uk to find out more about our workshop.